Situations may arise where the father of a child is not listed on the birth certificate at birth. Either the father is not known, the father denies paternity, or the couple has some other reason for leaving this information out. Once the father is deceased, however, in order for the child to inherit from the father or to receive Social Security benefits based on the father's work history, the father's name must be listed on the birth certificate. 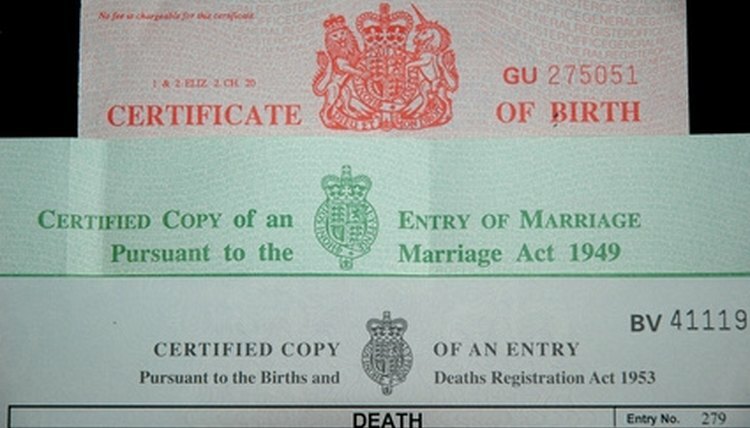 Adding the father's name to a birth certificate after the father has died is a delicate process and may require the assistance of an attorney. Contact an independent genetic testing agency in your area. Explain that you need to test DNA from a deceased person to check paternity. The agency will help you with the rest of the details. Fees will be involved and will vary depending on the agency. Visit your local county court. Ask the clerk to provide you with forms to initiate a paternity action. Fill out the necessary forms to initiate the action; the type and nature of each form will vary depending on the county court rules. Offer proof to the judge that the deceased is the father of the child. Since the father is dead, you will need to offer the genetic evidence obtained in Step 1. Receive an order from the court establishing that the deceased is the father of the child. Once a court rules that the deceased is the father, the court will issue an order declaring this fact. Submit the court order to your state's Department of Health. Tell the Department of Health that you are looking to add the name of the father to the birth certificate on record with your state's Department of Health. Fees will be involved here as well; the fees will vary from state to state. Lawrence, George. "How to Add a Deceased Father to a Birth Certificate." , https://legalbeagle.com/6151650-add-deceased-father-birth-certificate.html. Accessed 23 April 2019. How Can I Get a DNA Test for a Deceased Father?